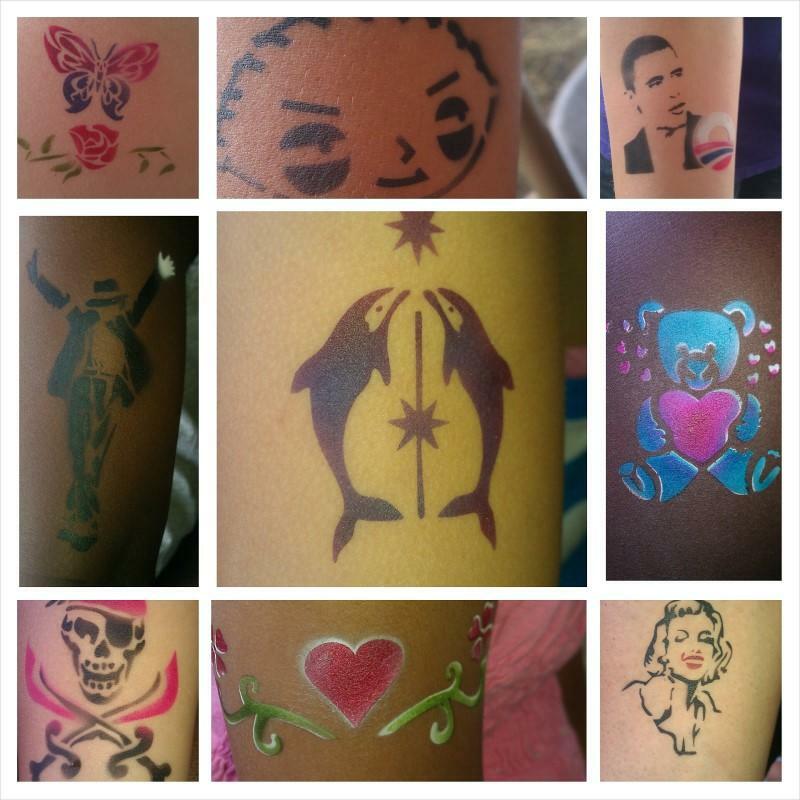 Perfect for tween and teen parties, Bar & Bat Mitzvahs, Debutantes, and Special Events, our airbrush tattoos are applied with a professional airbrush using skin safe cosmetic inks and can last up to 2 weeks! 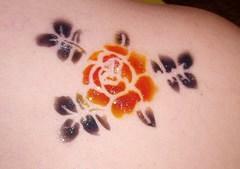 Temporary Airbrushed Tattoos is one of the coolest activities Chicago Party Place/Let the World Know offers. All we need is power...(and maybe a couple of chairs...)...Our temporary airbrushed tattoo artists provide everything else including a booklet of designs. to provide your with an interactive activity that they will will talk about forever. ***Please note: Unlike most companies, our airbrush face paint tattoos come off the same day! *** We use FDA approved liquid face paints that are washable and wipe off that night. Same day removal of product makes us a favorite for schools, malls, and large venues. Please email us for more details on how we can customize the stencils and designs used for your party. What is an Airbrushed Temporary Tattoo ? Airbrushed tattoos are created by placing a custom stencil to the skin and applying the airbrush tattoo paint with an airbrush. The designs are applied to the surface of the skin and do no damage to the skin. Unlike temporary transfer tattoos (that are applied with a wet towel), the artist can control delicate elements of the temporary tattoo while it is being produced to create a custom design to your liking, which is much more similar to the permanent tattoo experience (but no needles are involved)...In fact, most guests say it tickles a little. The airbrushed tats are waterproof, dry almost instantly, and can last on the skin for up to 14 days with proper care . A: All tattoos are real. Some are temporary, some are permanent. These will last anywhere from 1 - 14 days depending on your skin type, where you put the tattoo and how well you treat it. Legs, in general, last the longest, then arms, back and chest/stomach. Oily skin will cause the tattoo to come off faster than normal skin. Further, it is not recommended that the tattoo be placed directly under tight clothing. Also, even though the tattoo is water resistant, we clothing may cause it to wear off faster. A:Yes, our temporary airbrush tattoos are waterproof, however, you must take care of them. Do not rub or scrub tattoo, pat or air dry tattooed area. powder after bathing and before sleeping. keep tight fitting clothing from rubbing on TAT. Do NOT apply any oils or lotions on tattoo. do NOT shave over tattoo. Q:How long before they dry? Q:How do I take them off? A:If you need to remove the tattoo, you can do also with rubbing alcohol. A:The body paints are made with all FDA approved non-toxic ingredients. Power and small table is required. We can supply both for an additional fee.